In this final chapter, some considerations are advanced towards what might constitute a national system of continuing education and training. The discussion here draws upon findings from the interviews, survey and focus groups with workers, their managers and CET providers who participated in the Australian study noted in earlier chapters in this section (Billett et al. Towards more effective continuing education and training for Australian workers. NCVER, Adelaide, 2014). In addition, the views of senior figures from large national institutions and agencies with responsibilities for continuing education and training who contributed to that study are taken into account. Here, a range of models for the provision of continuing education and training are advanced and discussed, as well as sets of practices which might promote the kind of ongoing work-learning that constitutes effective continuing education and training. 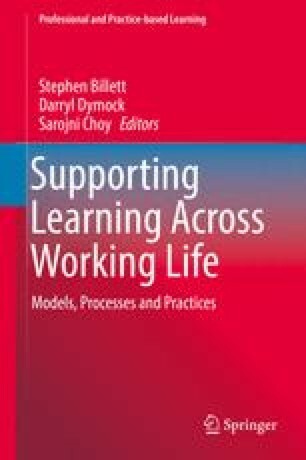 Then, building upon ideas from the contributions to this volume, a broader set of premises for ongoing learning across working lives are advanced in terms of how these arrangements might flow through to a wider range of occupations and circumstances of work than those within the national study from Australia. Department of Industry (DoI). (2014). Vocational education and training reform – the VET reform vision: A new partnership between industry and skills. Available at: http://www.vetreform.industry.gov.au/vet-reform-vision. Accessed 20 Nov 2014. United Kingdom Commission for Employment and Skills (UKCES). (2014). The future of work: Jobs and skills in 2030. Available at: www.ukces.org.uk/thefutureofwork. Accessed 20 Nov 2014.